Sinn Fein Leader Questioned In 40-Year-Old Murder Case : The Two-Way Gerry Adams, the political group's longtime president, says he rejects "malicious allegations" tying him to the kidnapping and killing of an alleged British spy in Northern Ireland in 1972. Sinn Fein President Gerry Adams is in custody and being questioned in connection with a 1972 kidnapping and murder. The leader of Sinn Fein, Gerry Adams, was in custody for a second day in Northern Ireland as police questioned him in connection with an IRA kidnapping and murder that occurred more than 40 years ago. Adams, 65, has long denied any involvement in the abduction and killing of Jean McConville in 1972. McConville, a Belfast mother who was suspected of being a British spy, is one of 16 people known as "The Disappeared" who were murdered by the Irish Republican Army and given secret burials. Sinn Fein issued a statement saying Adams had made himself available for what they called a "meeting" with the police. The arrest was prompted in part by a Boston College-sponsored history project on the conflict in Northern Ireland that included taped interviews with individuals who implicated him. 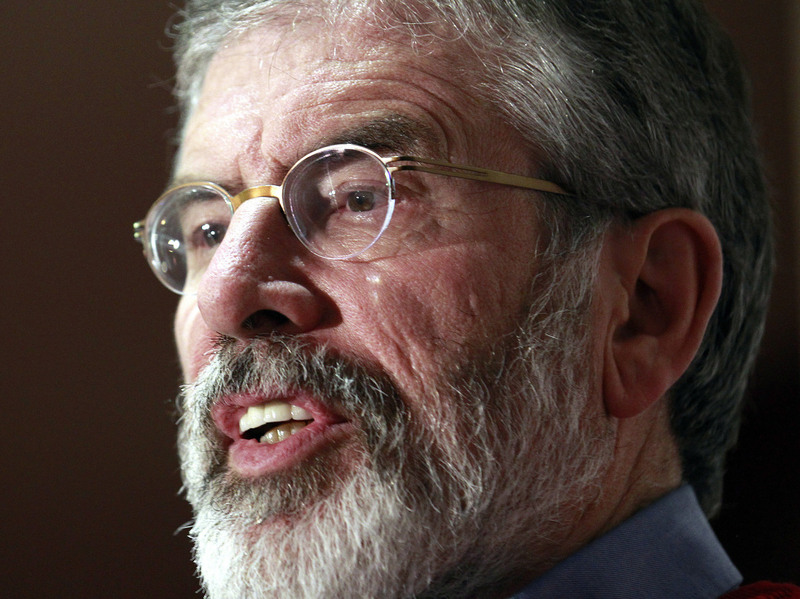 Adams has been president of Sinn Fein, a party once considered the political wing of the IRA, for three decades. He played a key role in the 1998 peace agreement that ended the conflict. "Senior politicians in Adams' Irish nationalist party said they hoped he would be released soon without charge and accused British authorities of timing Wednesday's arrest to undermine Sinn Fein's campaigning in elections taking place in both parts of Ireland later this month. "Under Northern Ireland's anti-terrorist law Adams can be held until Friday night, by which time police must release or charge him, or seek a judicial extension to his custody. "Adams, 65, has always denied any role in the outlawed IRA, but every credible history of the Sinn Fein-IRA movement has identified him as a senior commander since the early 1970s. The IRA killed nearly 1,800 people from 1970 to 1997, when it ceased fire to permit Sinn Fein to pursue peace negotiations with Britain and leaders of Northern Ireland's Protestant majority." "Last month I said that I was available to meet the PSNI [Police Service of Northern Ireland's Historical Enquiries Team] about the Jean McConville case," Adams, 65, said in a statement issued by Sinn Fein. "I believe that the killing of Jean McConville and the secret burial of her body was wrong and a grievous injustice to her and her family," he said. "Well publicized, malicious allegations have been made against me. I reject these. "Jean McConville, a widowed mother of 10, was abducted and murdered by the IRA in December 1972," he said. "While I have never disassociated myself from the IRA and I never will, I am innocent of any part in the abduction, killing or burial of Mrs. McConville."